This Post has already been read 331 times. As the world moves through the 4th Industrial revolution, significant changes are expected throughout the world as with the previous three. The underlining technologies this time around however will be Artificial Intelligence and Blockchain. NETSOL and Telenor Velocity are realizing the need of the hour, and are giving the young tech minds a platform to shine though the “Innovation HackFest 2018 powered by Telenor Velocity – Telenor Pakistan’s Digital Startup Accelerator, and NSPIRE – NETSOL’s Business & Tech Incubator in Pakistan”. The event is set to take place from 2nd till 4th of November 2018 where teams will be given problem statements around AI and Blockchain technology and will have approximately 48 hours to provide a solution. “I am a firm believer in Pakistan and its youth. It has been our vision to create an enabling environment for the youth to take over their dreams and surprise the world with their talent.” shares Mr. Salim Ghauri – Founder and CEO NETSOL Technologies, “Backing by Telenor Velocity guarantees the fact that the event will be a showdown of innovation”. 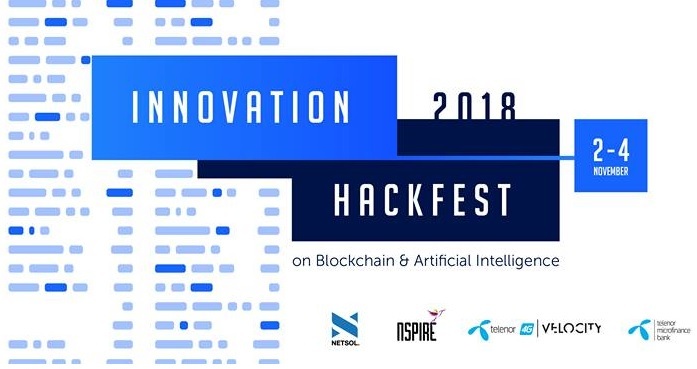 “This HackFest shall allow startups working in the domain of Artificial Intelligence and Blockchain technologies to step ahead and build onto their ideas,” says Durdana Achakzai – Chief Digital Officer at Telenor Pakistan. “Unfortunately very little is being done in both these fields and we earnestly believe that Pakistan has immense untapped potential. Such is the foresight of this Innovation Hackfest as well,” she adds. Experts from the Software, Telecom, Fintech and Startup space will be mentoring the teams throughout the three-day plan while the finale will end with the judges selecting the winning teams based on their product ideas and demonstration. With Rs.500,000 up for grabs in prize money, and an opportunity to network with some of the leading proponents in AI & Blockchain from Pakistan, this should be an event for all AI & Blockchain enthusiasts to look forward to. Innovation HackFest is open for applications till 22nd October. To apply, click here and to stay updated, follow Innovation HackFest 2018 on Facebook.